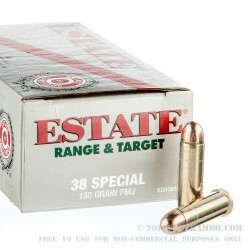 This 38 Special round by Estate Cartridge sports a 130 grain projectile. 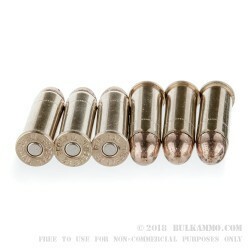 Its bullet’s full metal jacket makes this cartridge ideal for training, as it will prevent the rapid accumulation of lead residue in your bore so you may enjoy better accuracy for longer in between cleanings. The cartridge’s subsonic 1,050 fps muzzle velocity will keep your ears happy while you shoot all day long as well. 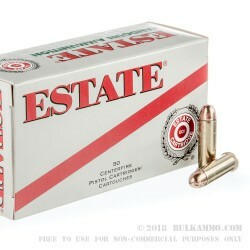 Estate Cartridge’s forte is providing shooting enthusiasts with exceptional value for low prices. This round’s attractive price makes it just the thing for high-volume shooting, because you can focus on your aim rather than your wallet. 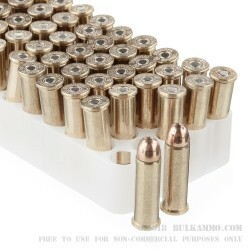 These rounds’ Boxer primed brass casings make them a great deal as well, as you can keep them in play courtesy of your reloading bench for multiple upcoming trips to the range.